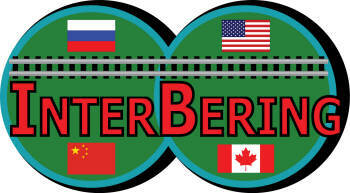 INTERBERING - RUSSIAN-AMERICAN TEAM: WORLD NEEDS BERING STRAIT TUNNEL. APRIL-24-2007. WORLD NEEDS BERING STRAIT TUNNEL! Several hundred people gathered in Moscow on April 24 at a conference called "Megaprojects of Russia's East: A Transcontinental Eurasia-America Transport Link via the Bering Strait." News of their discussions touched off a wave of optimistic thinking in many countries, that the time has arrived for one of the greatest of great infrastructure projects, a tunnel beneath the Bering Strait between Alaska and Russia's Chukotka Region. The participants issued an appeal to governments of the Group of Eight member countries, to place the Bering Strait megaproject on the agenda of the G-8 summit in Heiligendamm, Germany, in June. Russia's Ambassador to Canada Georgi Mamedov told the Toronto Globe and Mail that he is now optimistic that the tunnel will be built. Mamedov expects President Vladimir Putin to discuss the Bering Strait project with Canadian Prime Minister Stephen Harper, when they meet in Heiligendamm. "We need Canada aboard," he said. It is fitting that two American participants from the World War II generation put forward the idea that such great development projects are the path leading away from war. They were former U.S. Secretary of the Interior and Governor of Alaska Walter Hickel, a strong backer of the Bering Strait tunnel project for many years (see his paper, "Megaprojects Post Alternative to War"), and EIR founder Lyndon LaRouche, whose contribution, "The World's Political Map Changes: Mendeleyev Would Have Agreed," was read to the gathering. LaRouche, who as early as 1978 called for a Bering Strait bridge-tunnel crossing, wrote the article in response to a request from conference organizers, for publication in connection with the event. The Americans radiated confidence that this can be done, bringing North America into the Eurasian development perspective that is otherwise being promoted through such agencies as the Shanghai Cooperation Organization. It would be, as LaRouche said in Moscow in 2001, part of "the greatest transformation of the biosphere in history." High-level Russian specialists from Federal agencies, regional governments, and the Russian Academy of Sciences took part in the Bering Strait meeting, along with specialists from Japan and Korea. It was the first of a "Megaprojects of Russia's East" conference series, organized by the Russian Academy of Sciences Council for the Study of Productive Forces (SOPS), in conjunction with the Russian Ministry of Economic Development and Trade (MERT), the Russian Ministry of Transport, the state-owned company Russian Railroads, and several regional governments in Siberia and the Russian Far East. Victor Razbegin, who works in the MERT's Industrial Research department, gave a press conference on April 18 with other members of the Bering Strait project group, to publicize the forthcoming conference. Their huge map of the Arctic connection, and their enthusiasm for the $65 billion multi-modal project, with its associated long-distance rail and power lines, grabbed headlines in Russia. Over 60 stories about it appeared in press, web, and other electronic media, including a report on NTV, Russian national television Channel 2. NTV showed a dynamic map of the projected rail line from Yakutsk in East Siberia, through Nome and Fairbanks, to Fort Nelson in Canada. Academician Alexander Granberg, head of the SOPS, described the project's advantages, in an April 16 interview for the economics website OPEC.ru. He said the road, rail, and pipeline connection would handle 3% of total world trade in physical goods. It will make it possible to harness more of eastern Russia's hydroelectric potential. It will allow development of previously inaccessible mineral resource deposits. And, said Granberg, the connection of the power systems of Siberia, the Russian Far East, and North America will create economies in electricity supply, worth $20 billion annually. Russia's leadership, according to Granberg, now sees the development of transportation infrastructure as essential for uplifting Russia's vast outlying regions. Demonstration of this, he said, was an April 10 presentation by Vladimir Yakunin, head of the state-owned company Russian Railways, at a meeting on rail transport, chaired by Putin. There, Yakunin laid out the construction of a 3,500-km rail line from the Lena River to the Bering Strait, as a high-priority task. The Lena is the easternmost of Siberia's three great river systems, and is the tenth longest river in the world. Razbegin, like Governor Hickel, has been closely involved in efforts to secure action on the Bering Strait project, for over a decade, as our review of its history shows. 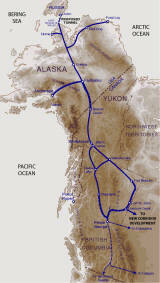 Another longtime Bering Strait tunnel enthusiast is the American engineer Hal Cooper, whose overview of the scheme EIR published in 1994, and whose detailed work-up of its parameters has recently drawn renewed attention from Russian, as well as American promoters of a Bering Strait crossing. Cooper told EIR the week of the Moscow conference, that the push for the project may have reached "a real phase shift" now. Speaking at the April 24 event, under big banners with maps of the intercontinental project, Academician Granberg said that the next step should be design and feasibility studies for the 6,000-km rail-road-pipeline-power corridor from Yakutsk to Fort Nelson, including 85-100 km of tunnel under the Bering Strait. There will really be two tunnels, Granberg pointed out, because Big Diomede Island (Russia) and Little Diomede Island (U.S.A.) lie close together in the middle of the strait. Since Japan already has built 50-km underwater tunnels between its islands, Granberg remarked, the technologies involved are proven ones. Conference participant Louis Cerny of the American Railroad Association also presented the technical feasibility of the Bering Strait crossing, noting that the schedule for the project as a whole could be sped up by simultaneous construction of its different parts. Many of the Russian speakers referred to recent government decisions, which make the Bering Strait project a live option. One of these is the Federal Target Program called "Development of the Far East and Transbaikal Region" to 2013. As EIR reported April 13 ("Russian Far East: A World Great Project," by Mary Burdman), Prime Minister Mikhail Fradkov has been active in launching an array of measures to address the underdevelopment and depopulation of these regions. Dr. Jonathan Tennenbaum, a collaborator of LaRouche for many years, introduced LaRouche's paper to the conference as the work of the American economist, best known in Russia for his Science of Physical Economy and his advocacy of basic infrastructure projects. LaRouche's discussion of the legacy of chemist and national economist Dmitri Mendeleyev, as well as his relating the cooperation of great nations on the Bering Strait project to the tasks of war-avoidance, were received with interest by the Russian participants. Tennenbaum, who is known in Russia especially as a co-author of EIR's 1997 Special Report The Eurasian Land-Bridge: The 'New Silk Road' - Locomotive for Worldwide Economic Development, then elaborated the concept of infrastructure corridors, and networks of intersecting such corridors. Building them in the far north is a challenge for the 21st Century, he said, which can be met by building chains of nuclear-powered cities. U.S. work on building the nuclear-powered research town, Camp Century, under the ice in northern Greenland in the 1950s, together with Russia's city-building experience in Siberia, makes this a tailor-made area for U.S.-Russian cooperation, Tennenbaum said. Maxim Bystrov, deputy head of Russia's Federal Agency for Special Economic Zones, picked up on LaRouche's and Tennenbaum's remarks about the enormous financial bubble that exists today, as against the potential for directing funds into productive investment like these infrastructure projects. Liquidity won't flow into long-term projects on its own, Bystrov stressed. 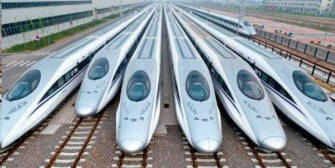 He said that the Russian government would advocate attracting private concessionaires for the project, rather than rely solely on state funding from the countries involved. At the same time, Bystrov said that his agency was prepared to put up $120 million for the feasibility studies. Governor of Yakutia (Sakha Republic) Vyacheslav Shtyrov, whose paper was read to the meeting by the region's representative in Moscow, discussed the enormous development potential of that East Siberian region. With a land area equal to half the size of the lower 48 U.S. states, covering three time zones and extending to the Arctic Coast, Yakutia's population is less than that of Rhode Island. Shtyrov noted that "we have all of the elements of Mendeleyev's periodic table" in Yakutia, as well as enthusiasm for Mendeleyev's ideas about development. News of the high-level Russian backing for the Bering Strait tunnel project was welcomed across Eurasia, from Sweden to Japan. Dagens Industrie, a Swedish business newspaper, reported favorably on it in the April 25 issue. German press coverage cited enthusiastic responses from China, Korea, and Japan, including the view of some Japanese business circles that the tunnel could be built more cheaply than the estimates cited at the Moscow conference. In Denmark, where national attention has been focussed on the Schiller Institute's program for magnetic levitation rail infrastructure, Schiller Institute leader Tom Gillesberg pointed out that Vitus Bering, for whom the strait is named, was a Dane in the service of the Russian Navy, during the time of Peter the Great in the early 18th Century. Publication of a story about the Bering Strait project on the Saudi Arabian news website Elaph.com brought forth contagious optimism. The report said, "The cost of this gigantic transport project, $65 billion, will be quickly paid back through the revenue, created by the transit of goods between the countries in the region." Comments on the site, from readers in Arab countries, as well as Arab-Americans and Arab-Canadians, urged the Arab states to learn from Russia, Canada, the U.S.A., and Asia, and launch construction of a network of railroads and bridges throughout the Arab world, from the Persian Gulf to North Africa. In Russia itself, many identify the Bering Strait project with LaRouche. The Bering Strait rail line was shown on maps in EIR's 1997 Special Report on the Eurasian Land-Bridge. Academician Sergei Rogov of the Institute of the U.S.A. and Canada, and Academician Vladimir Myasnikov, then of the Far East Institute, used reproductions of EIR's map, to illustrate their own articles on Eurasia's development potential, appearing in major Russian publications in the late 1990s. Typical of the Bering Strait project's reputation as LaRouche's idea, and of the growing sense of such ideas' potential to change even the most rigid institutional attitudes, is a Russian blogger's comment, posted April 23. With reference to a recent U.S. State Department report, which pledged support for regime-change in the former Soviet region under the banner of "pro-democracy" movements, the writer commented: "This I must mentally applaud: answering the State Department's latest attack, by proposing a gigantic, joint investment project - the dream of Lyndon LaRouche, who advised the Democrats during the most recent Congressional elections; and this from the Ministry of Economic Development and Trade, no less, though it's headed by one of our dyed-in-the-wool liberals!"